Given today’s global business environment, an international perspective international is an essential part of a student’s undergraduate education. To that end, Wharton students are required to take 3 CUs that have substantial international content. Global Environment courses may not be taken pass/fail. A maximum of one business course may be used to satisfy a Global Environment requirement. This business course may not double count with any other requirement. International students are not permitted to fulfill this requirement with courses about the United States. 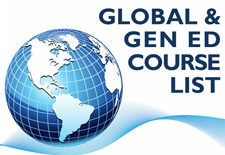 View a list of approved Global courses. If you have questions about Global courses, please meet with an academic advisor in the Undergraduate Division. NOTE: Students in the Management and Technology, Nursing and Healthcare Management, and Life Sciences and Management coordinated dual-degree programs may only take liberal arts (non-business) courses to fulfill the Global Environment requirement.